The 2B™ Pro Pack from E-Stim Systems Ltd.
For the very best in e-stim controllers and advanced extras to ensure you have the best electrostim set up. 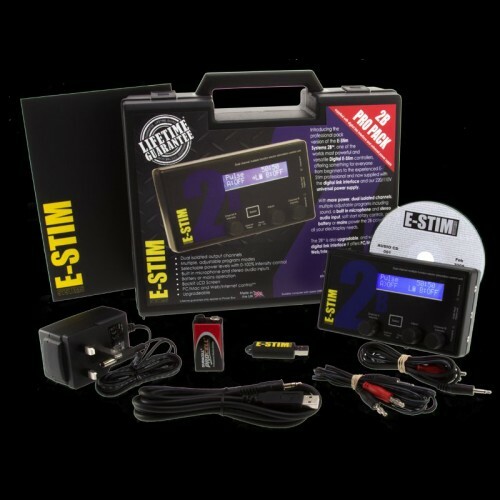 This kit is the professional pack version of the E-Stim 2B™, which itself is a powerful and versatile digital E-Stim controller. The pack includes the 2B™ Digital Link Interface and 2B™ Universal Power Supply. Plus you get all the sophisticated electroplay technology and advanced features that the E-Stim 2B™ offers. Intended for everyone, no matter whether you're completely new to electrostim or an experienced E-Stim Pro - Get the best in E-Stim! Power Standard 9 Volt Alkaline (PP3) + 220V or 110V mains via included power supply.